As the NFL regular season winds down this weekend there are a few coaches across the league who should be cleaning out their offices as their players are emptying their lockers. For some we’ve seen it coming for quite a while now and for others a second half collapse this season is what has the rumor mills turning. Regardless of the circumstances the writing is on the wall for these guys. Rod Marinelli, Detroit Lions – Cam Cameron didn’t survive a 1-15 season in Miami last year and there is no way Marineli will survive being the only NFL coach to guide his team to a perfect 0-16 record. In three season in the Motor City Rod Marinelli has compiled a 10-37 record with one more loss on the way this Sunday at Green Bay. Herm Edwards, Kansas City Chiefs – Sunday’s loss to the Miami Dolphins guarantees that the Oakland Raiders will have a better record than the Kansas City Chiefs. Edwards led the Chiefs to a 9 win season in 2006 and Kansas City bowed out of the Wild Card round of the playoffs at the hands of the Indianapolis Colts. 2007 brought 4 wins to Kansas City and through the first 15 games of 2008 they have 2. The departure of team president and general manager Carl Peterson last week paved the way for Edwards’ departure within the next couple of weeks. 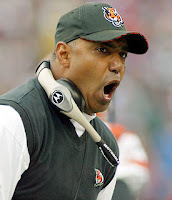 Marvin Lewis, Cincinnati Bengals – It just hasn’t worked out for Lewis in the Jungle. The highlight of his tenure in Cincinnati came in 2005 when the Bengals finished 11-5 but that is the only time they finished above .500 under his watch. 2008 brings the worst season of his six years (Cincinnati is currently 3-11-1) and marks the second year in a row with a losing record. Romeo Crennel, Cleveland Browns – Cleveland is looking at a 4-12 finish to the 2008 football season. Even if they win against the Pittsburgh Steelers this weekend a 5 win season would still be way below expectations. The Browns have lost ground in the AFC North and one winning season out of four just won’t cut it for Crennel. Wade Phillips, Dallas Cowboys – The problem with being a puppet is that you have to dance when the puppet master pulls the strings. I’m a firm believer that Jerry Jones’ influence in the day-to-day operations has damaged the team and hindered the success of coaches. Phillips’ resume wasn’t impressive when he arrived in Dallas but after a 13-3 season last year people in Big D were talking Super Bowl for 2008. Now the Cowboys must beat the Eagles this weekend just to sneak into the Wild Card. If they lose then Phillips is gone!